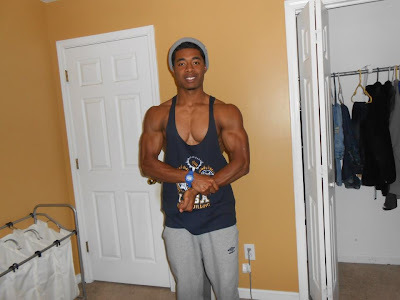 One of the newest guys on FlexingLads, MrBremsstreifen - check out his Man of Steel video . . .
Watch in 720p HD fullscreen! Sub Teen-Musclegod / MrBremssreifen here! In under 3 days, MrBremsstreifen's subs went from 703 to 839, so I think he'll soon be celebrating his first 1000 subscribers :) I know FL helped out, but the credit, as always, goes to the guy whose who's in the video! 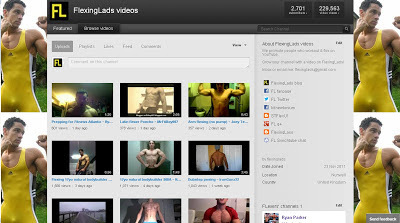 FlexingLads main web presence in 2012 has been our YouTube channel and this blog. We expanded to other social sites, some of them listed here, along with a couple of other blogs (not updated much). FL's Christmas Day video was an unexpected gift from a guy new to our channel - Correll Bufford aka BuffCorrell. 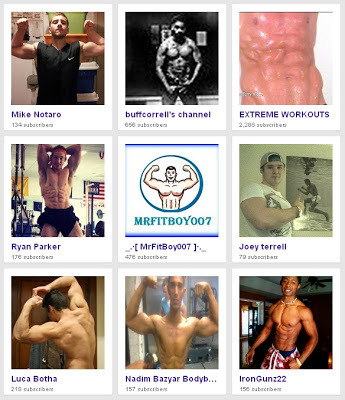 Here's a shot from Correll's Bodyspace - he has 100s more - check them out! And that Xmas clip . . .
...is what the guys on ExtremeWorkouts do! You can see that in this preview, where ripped, fit lads get sweaty and work out to exhaustion! Be sure to visit & sub their channel - and ask about their 60 minute DVDs! If you like our blog, sub our channel, too! Since our last post (Dec 4) about FL-featured guys, 9 new channels have put videos on FlexingLads. We now feature so many, we can't fit them all onto our YouTube page, which only allows a maximum of 36! Update: 10 new channels - we added MrBremsstreifen today . . .
Louis Smith and partner Flavia Cacace won the Strictly final tonight. Louis's fitness and gymnastic skills applied to dance had a lot to do with that. The show is incredibly ghey. It mostly consists of camp ballroom, and outfits to arouse viewers' jaded sexual appetites. But sometimes - as in this case - real dance occurs! Watch in 1080p HD fullscreen! Links to his social sites in the video description! New YouTube milestone: 2700 subs. Now we go for 3000 by 2013 February 28. 2,701 FL subscribers on 2012/12/21 - 299 to go . . . If you haven't already, click below to sub FlexingLads channel! From Michael's Facebook - more here - please "like" his page! Michael says: "If you guys have any fitness questions or how to do an exercise correctly shoot me a message and I'll make a response vid. Y'all enjoy! Like my page on Facebook and follow me on Instagram for more updates. And help support me through my journey to my 1st competition in May! If you like FL blog, sub our channel! A Xmas :-* with Tom? Two FL uploads from Gerhard Muscles . . .
Sub: Gerhard Muscles for more videos! FL channel now features 34 people into fitness and flexing, most with their own channels. Here's a list - why not to check them out & subscribe? You can also find these channels on our own YT Featured page. There are so many, we need two lists. You'll easily spot the main block under the featured video, but don't miss the right hand column, where more channels are listed. Some people have two or three clips on FL, so our total so far is 48 flexing videos. Watch out for new FLexers and videos this month!